In the summer months Tinos has regular direct ferry connections to Santorini while in the winter you can easily get from Tinos to Santorini with indirect ferry connections via Mykonos. The ferry trip duration of the Tinos - Santorini route varies according to the ferry type: for example the ferry ride with a high speed vessel lasts approximately 3 hours while with a conventional ferry the duration is around 5 hours. The ferry ticket prices are subject to change every year but indicatively (and based on data from 2019) the standard economy ticket for this ferry route starts from around 40€ . How long is the ferry trip from Tinos to Santorini? The distance between Tinos and Santorini is approximately 129 km (80 miles). The ferry route is operated by both high speed and conventional ferries so the ferry ride duration can range from 3 hours to 5 hours. How often ferries depart from Tinos to Santorini? If you want to take a direct ferry from Tinos to Santorini there is at least one ferry every day during the summer season that connects the two islands. If the departure times do not suit your plans, or you are a bit more adventurous or you just want to do some island hopping in the Cyclades, there is the indirect option of taking a ferry from Tinos to Mykonos and then a ferry from Mykonos to Santorini. Find more helpful information about the Mykonos to Santorini ferry route, here. On the day of your departure from Tinos make sure that you arrive to the port slightly earlier than your departure time as there might be traffic in the roads around the port. 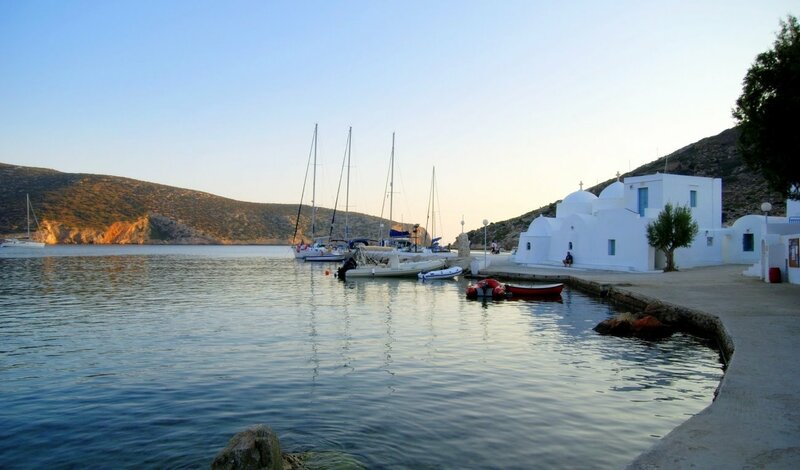 In the summer months the port of Tinos might be extra busy, with multiple ferries arriving or departing at the same time so it would be good to arrive around 40 minutes in advance of your ferry trip. The ferry ride in the Aegean sea can be bumpy due to the wind that might be stronger and more frequent during the summer. In the case that you feel nausea, don’t worry. Go on the deck to take fresh air and look at the horizon. If this is not an option or travel sickness remains, you can ask the ferry crew to provide you with an aspirin or an anti-nausea tablet. Santorini is a very popular summer destination so we would suggest that you book your ferry tickets well in advance. Also, if you are planning to get your vehicle (car or motorbike) from Tinos to Santorini it would be good to check the vehicle availability of the ferry that you choose and that you book your ferry tickets and your vehicle ticket at least 2-3 months in advance of your travel date. If you would like to spend a night or two in Santorini, it would be best to book your accommodation at least 3 months in advance as cheap accommodation options sell out fast in Santorini. Santorini is also ideal for island hopping as it has ferry connections with the Aegean islands like Mykonos, Naxos or Ios, with Crete (Heraklion) as well as the islands of the Dodekanese like Rhodes or Kos. Search Ferryhopper and find all the ferry schedules and ferry tickets from Tinos to Santorini as well as all the available itineraries from Santorini and get the chance to explore the beauty of the Greek islands!